An International team led by CONICET researchers managed to obtain a detailed image of the nebula through the electromagnetic spectrum. This opens up the possibilities for new physical research. In 1054 BC, Chinese and Arabian astronomers saw the powerful explosion of a star that led to the Crab’s Nebula, at approximately 6.500 light years from the Earth, in the constellation of Taurus. This nebula has a diameter of six light years, with an expansion rate up to 3.000 km/seconds. As a result of the stellar explosion known as supernova, gaseous remains are generated and expand in the interstellar medium for dozens of thousands of years. The supernovas are some of the most energetic phenomena that occur in the universe and give rise to the diversity of atoms that exist. Two CONICET researchers lead an international work group that managed to produce a detailed image of the Crab Nebula, one of the most enigmatic supernova remains of the Galaxy. For this reason, they integrated all the information obtained from different telescopes which cover almost all the bandwidth of the electromagnetic spectrum. The team was led by Gloria Dubner, CONICET senior researcher at the Instituto de Astronomía y Física del Espacio (IAFE, UBA-CONICET) and Gabriela Castelletti, CONICET associate researcher at the same institution. The study was published in Astrophysical Journal. “We managed to obtain the greatest quality radio waves image of the Crab Nebula. This image and the combination of how that is seen through all the electromagnetic spectrum enabled scientists to discover aspects that lead to new physical research such as the features of the magnetic fields and the particles at relativistic speeds. After analyzing all the bands of the spectrum, we found that the x-rays did not behave as radio waves so there had to be more than population of accelerated particles. Evidently, something happens in the nebula nucleus that creates particles with different energies”, Dubner explains. 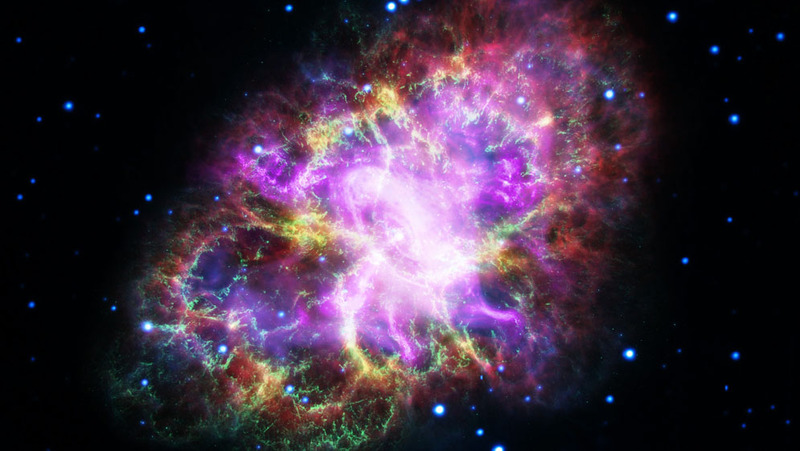 The scientists found that in the center of the Crab Nebula there are more than one population of relativistic particles. Accelerated by the neutron star and the magnetic fields, these particles have a topology similar to the one the Sun has during its fulgurations –eruptions– but energetically larger. This behavior was predicted many years ago but it has not been observed up to now. “In order to do this study, we managed to perform two observations simultaneously on the same day in the 27 anthems telescope of New Mexico (VLA, Very Large Array), USA, Hubble space telescope and the Chandra x-ray observatory. As the filaments move so fast, it was necessary to program everything for the same day because we wanted to see how the filaments looked like in the three bands. We also had two satellites and a telescope programmed for the same day, and that is something exceptional”, Dubner concludes. – G. Dubner. Senior reseracher. IAFE. – G. Castelletti. Associate researcher. IAFE. – O. Kargaltsev. George Washington University, USA. – G. G. Pavlov. University Park, USA. – M. Bietenholz. York University, Canada. – A. Talavera. XMM-Newton Science Operations Centre, Spain.